An international research group, together with scientists from the MSU, have developed a time-resolved spectroscopy method that allows studying fast processes in samples. The new method works by analyzing quantized light transmitted through a sample without the use of femtosecond lasers and complex detection systems. This design is much cheaper than the one used currently, and allows researchers to study a sample without destroying it. The research has been published in Scientific Reports. One of the most common ways of investigating interactions and processes occurring in a substance is measuring the time in which a sample responds to external electromagnetic fields affecting it. According to this measure, it is possible to judge which connections exist between the components of the substance. As these times are often measured in femtoseconds (10-15 sec), researchers use femtosecond lasers capable of generating ultrashort pulses. The problem is that femtosecond lasers have high power, and therefore can damage the sample; secondly, these lasers are expensive. 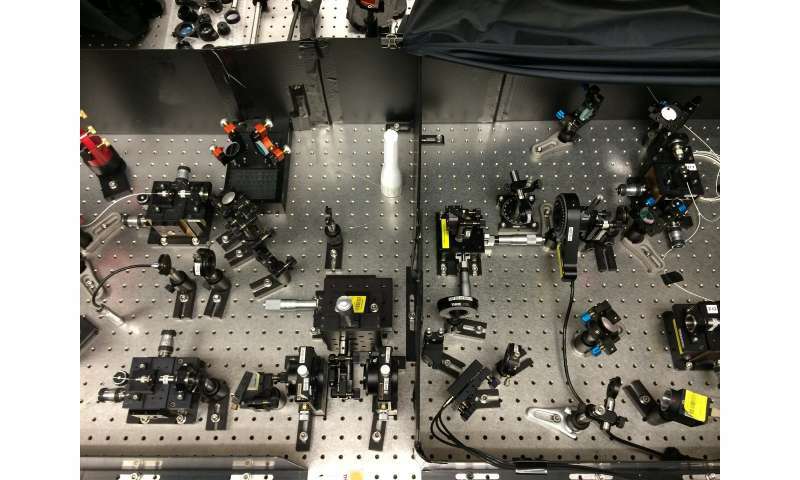 To solve this problem, the researchers have developed a scheme that allows studying samples with single photons and using ordinary lasers for producing them. The setup consists of a simple interferometer that makes it possible to accurately measure the interference of light. In the assembled circuit, a nonlinear crystal is located on the laser path. Pairs of entangled photons produced in the crystal fly off at a certain angle. Quantum entanglement consists of two or more separate particles whose physical properties are so correlated that the quantum state of each particle cannot be described independently. The test sample is set inside one arm of the interferometer. One photon of the entangled pair passes through it and hits the beam splitter, where it meets its counterpart, which has passed through the second arm. After that, the photons fall on one of two detectors, which react to single photons. That makes it possible to construct a coincidence circuit—if both photons go to the same detector, zero coincidence exists; if they go to different detectors, the coincidence value is one. At the moment that the delay between the two arms becomes absolutely identical, quantum interference occurs—coincidence completely disappears, since photons will never fall on both detectors simultaneously. If the sample is set into the photons' path, the pattern of quantum interference starts to change. In this case, the pairs of entangled photons that come to the splitter become less "identical" than in a situation without a sample. Because of this, the photon reception statistics on the two detectors changes, and via the statistical changes, researchers can judge the nature of the interactions in the substance under study—for example, they can estimate the transition time from the excited state to the unexcited state. For her work, Melik-Gaikazyan built an experimental setup, measured the interference pattern with and without the test sample, obtained experimental data and analyzed it. The researchers have tested and verified the method on two samples: an aluminum-yttrium garnet with neodymium and a matrix of dielectric nanoparticles.